Production: Impéria Films, Société Nouvelle de Cinéma; black and white, 35mm; running time: 89 minutes. Released 16 March 1960, Paris. Filmed 17 August through 15 September 1959 in Paris and Marseilles; cost: 400,000 N.F. (about $120,000). Producer: Georges de Beauregard; screenplay: Jean-Luc Godard, from an original treatment by François Truffaut; photography: Raoul Coutard; editors: Cécile Decugis with Lila Herman; sound: Jacques Maumont; music: Martial Solal from Mozart's Clarinet Concerto, K.622; artistic and technical advisor: Claude Chabrol. Cast: Jean Seberg ( Patricia Franchini ); Jean-Paul Belmondo ( Michel Poiccard, alias Laszlo Kovacs ); Daniel Boulanger ( Police Inspector Vital ); Henri-Jacques Huet ( Antonio Berrutti ); Roger Hanin ( Carl Zombach ); Van Doude ( Journalist Van Doude ); Liliane Robin ( Liliane ); Michel Favre ( Plainclothes inspector ); Jean-Pierre Melville ( Parvulesco ); Claude Mansard ( Used car dealer, Claudius ); Jean Domarchi ( Drunk ); Jean-Luc Godard ( Informer ); André-S. Labarthe, Jean-Louis Richard, and François Mareuil ( Journalists ); Richard Balducci ( Tolmatchoff ); Philippe de Broca; Michael Mourlet; Jean Douchet; Louiguy; Virginie Ullman; Emile Villon; José Bénazéraf; Madame Paul; Raymond Ravanbaz. Awards: Prix Jean Vigo, 1960; Best Direction, Berlin Film Festival, 1960. A bout de souffle (screenplay plus Truffaut's original scenario and quotations from reviews) in L'Avant-Scène du Cinéma (Paris), March 1968; also published separately, Paris, 1974. Taylor, John Russell, "The New Wave: Jean-Luc Godard," in Cinema Eye, Cinema Ear , New York, 1964. Egly, Max, Regards neufs sur le cinéma , Paris, 1965. Goldmann, Annie, Cinéma et société moderne: Le Cinéma de 1958 à 1968 , Paris, 1971. Vaugeois, Gerard, and others, A bout de souffle , Paris, 1974. Douin, Jean-Luc, La Nouvelle Vague 25 ans après , Paris, 1984. Godard, Jean-Luc, Godard on Godard: Critical Writings , edited by Jean Narboni and Tom Milne, New York, 1986. Loshitzky, Yosefa, The Radical Faces of Godard & Bertolucci , Detroit, 1995. Dixon, Wheeler W., The Films of Jean-Luc Godard , Albany, 1997. Sterritt, David, Jean-Luc Godard; Interviews , Jackson, 1998. Truffaut, François, in Radio-Cinéma-Télévision (Paris), 1 October 1959. Variety (New York), 4 February 1960. Le Monde (Paris), 18 March 1960. Sadoul, Georges, in Les Lettres Françaises (Paris), March-April 1960. Billard, Pierre, and others, "Petit lexique de la nouvelle vague," in Cinéma (Paris), April 1960. Chevallier, J., in Image et Son (Paris), April 1960. Mopuller, Luc, "Jean-Luc Godard," in Cahiers du Cinéma (Paris), April 1960. Marcorelles, Louis, "Views of the New Wave," in Sight and Sound (London), Spring 1960. Seguin, Louis, in Positif (Paris), no. 33, 1960. Crowther, Bosley, in New York Times , 8 February 1961. Kauffmann, Stanley, "Adventures of an Anti-Hero," in New Republic (New York), 13 February 1961. Croce, Arlene, in Film Quarterly (Berkeley), Spring 1961. Gow, Gordon, in Films and Filming (London), August 1961. Steen, T. M. F., "The Sound Track," in Films in Review (New York), August-September 1961. Pearson, Gabriel, and Eric Rhode, "Cinema of Appearance," in Sight and Sound (London), Autumn 1961. Collet, Jean, and others, "Entretien avec Jean-Luc Godard," in Cahiers du Cinéma (Paris), December 1962. Feinstein, Herbert, "An Interview with Jean-Luc Godard," in Film Quarterly (Berkeley), Spring 1964. Lefèvre, Raymond, and Jean-Paul Warren, in Image et son: Revue du Cinéma (Paris), September-October 1964. Solokov, Raymond, "The Truth 24 Times a Second," in Newsweek (New York), 12 February 1968. Barr, Charles, " A bout de souffle ," in The Films of Jean-Luc Godard , edited by Ian Cameron, London, 1969. Houston, Beverle, and Marsha Kinder, "Jean-Luc Godard: Breathless ," in Close-Up , New York, 1972. Ropars, Marie-Claire, "The Graphic in Filmic Writing: A bout de souffle , or the Erratic . . . ," in Enclitic (Minneapolis), Fall 1981-Spring 1982. Falkenburg, Pamela, "'Hollywood' and the 'Art Cinema' as a Bipolar Modeling System: A bout de souffle and Breathless ," in Wide Angle (Athens, Ohio), vol. 7, no. 3, 1985. "Godard Issue" of Revue Belge du Cinéma (Brussels), Summer 1986. Durgnat, Raymond, in Monthly Film Bulletin (London), August 1988. Pulleine, Tim, in Films and Filming (London), August 1988. Jensen, G. H., "Filmvurdering," in Z Filmtidsskrift (Oslo), no. 2, 1990. Kulset, S., "Teoretiker til siste andedrag?" in Z Filmtidsskrift (Oslo), no. 1, 1991.
de Graaff, T., "Jongleren met ideeen," in Skrien (Amsterdam), December-January 1992–93. "Parigi, a bout de souffle," in Castoro Cinema , March/April 1996. 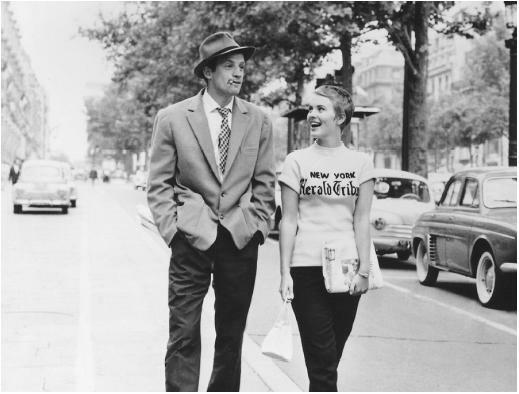 A bout de souffle was the first feature directed by Jean-Luc Godard and one of the films introducing the French New Wave in the late 1950s. Godard had made several short films before A bout de souffle , but this feature established the international reputation of the director who is regarded as one of the most important filmmakers of the 1960s. The film's story is fairly simple. Michel Poiccard (Jean-Paul Belmondo), a small time hood, casually kills a policeman. He goes to Paris to collect some money in order to leave the country, and tries to convince his American girlfriend Patricia Franchini (Jean Seberg) to go with him. She is less interested in accompanying him than she is in playing the role of an American intellectual in Paris. (She hawks the New York Herald Tribune on the Champs-Elysées while trying to establish herself as a journalist.) When Michel finally secures the money he needs and is ready to leave the city, Patricia betrays him to the police, and he is shot as he half-heartedly attempts to escape. This basic sequence of events is the minimal thread of continuity that holds the filmic narrative together. However, causal development and character motivation in the traditional sense are relatively loose. While the film does not reject narrative conventions as a whole, it goes a long way towards weakening the tight-knit structure and explanatory mechanisms affiliated with dominant narrative. The film's visual construction works even more aggressively against conventional film style. It systematically departs from the aesthetic guidelines and rules defined by continuity editing, relying variously on long-take sequences (often shot with hand-held camera) and jump cutting. The free-wheeling, almost casual, use of the camera is typical of the New Wave style. Within individual scenes the systematic use of jump cuts and depiction of rambling, repetitious conversations are a way of testing the limits of narrative film style. It often seems that scenes are conceived to show what can be done with cinema rather than to develop the story in a coherent fashion. While the film seems willfully to disregard the norms of commercial, studio filmmaking, it consistently refers to and plays with aspects of the American cinema. The main character, Michel, styles himself in the image of Humphrey Bogart. Early in the film he is seen standing by a movie poster admiring his hero's picture; in comparison his own status as a modern "tough guy" is only a weak imitation. The police on Michel's trail are similarly pale shadows of their predecessors in American films; they are bumbling, somewhat comical figures. The character of Patricia, and her portrayal by Seberg, refers to the role Seberg played in Otto Preminger's Bonjour Tristesse. There are also scenes constructed to "quote" sequences from American films. In Patricia's bedroom, Michel looks at her through a rolled-up poster. The camera zooms through the poster tube, followed by a cut to a close-up of Michel and Patricia kissing. These shots mimic a scene from Samuel Fuller's Forty Guns (with a rifle barrel instead of a poster) described by Godard in a review of the film as a moment of pure cinema. The film's playfulness extends beyond the inside jokes that refer to other films. The sometimes abrupt shifts in tone, style, and plot development within and between scenes are an investigation of (and challenge to) the medium, based on familiarity with and affection for its history. The opening of the film is instructive in this regard. Michel delivers a rambling monologue as he drives through the French countryside. He is speeding, and a policeman starts to follow him. Michel drives off the road, and when he is followed, shoots the policeman. The murder is casual in manner and lacking in clear motive. It becomes almosts a comic version of more serious crime dramas in which murders are fraught with tension and often defined as the act of ruthless or psychotic individuals. Because of his manner, the character of Michel is sometimes seen to exemplify the existentially alienated hero figure often found in New Wave films. Harsher critics condemn him as a character for his amoral, nihilistic behavior. However, this moralising attitude ignores the way in which the character derives from and parodies previous film hoodlums, and the appeal of the character as portrayed by Belmondo. In various ways the film exemplifies the conjunction of a number of factors contributing to the French New Wave cinema. This includes the use of relatively new cameras (a lightweight Eclair, easily handheld); working with low budgets, which promoted location shooting and stories with contemporary settings; and the use of new personnel, including the star Belmondo and cameraman Raoul Coutard. In addition Godard brought a set of attitudes to filmmaking shared by his fellow New Wave directors, derived from his experience as a film critic in the 1950s. Among these was the belief that the director was the responsible creative individual behind a film, that film should be approached as a mode of personal expression, and a deep admiration for the visual style of many Hollywood films. Beyond its status as a "New Wave film," A bout de souffle begins to define attitudes and concerns which are more fully developed in Godard's subsequent work. A broad range of cultural imagery is an integral part of the film's signifying material. Movie posters, art reproductions, and inserts of magazines and books not only function as elements of mise-en-scène, but also construct an image of contemporary life in terms of cultural collage. In addition the strategy of narrative digression is important, incorporating lengthy scenes to explore issues which do not serve to develop the story per se. In A bout de souffle Patricia's taking part in an interview with an author (played by French director Jean-Pierre Melville) functions in this way. Both of these practices testify to an interest in cinema as something more than a narrative medium in the conventional sense. As attention is directed to the ways in which filmic images and sounds create meaning, the very nature of cinematic signification becomes the central question for the director and his audience.